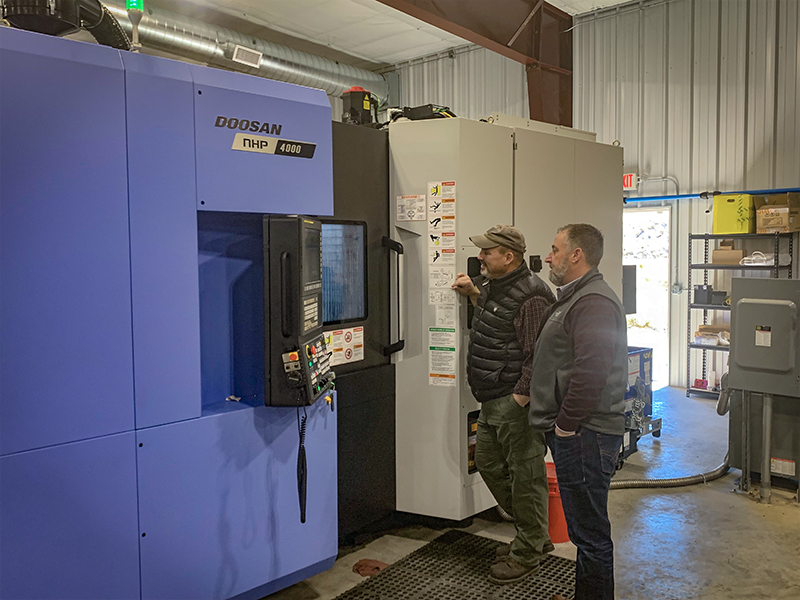 The machine tool industry is built on relationships, and TechMach—an Arkansas-based Doosan distributor—takes that fact seriously. Owner Rick Boedeker puts emphasis on building long-term relationships that ensure his customers have the technology and information they need to thrive, even as their needs change over time. A perfect example is PM Machine Company (PM), a contract manufacturing shop in Berryville, Arkansas. Owner Ken Hale and his staff handle production runs from 1,000 pieces up to 15,000 per order. Some of their legacy customers go back 30 years. Ken and Rick first met up in 1998. Ken tended to buy American–made machine tools, but when his then-current supplier started tacking on additional charges for features Ken thought should be standard, he started looking elsewhere. The first Doosan (then Daewoo) Rick sold them was a DMV 500 vertical machining center (which is still alive and kicking and making parts). “The pricing just made much more sense to us,” Ken stated. “We liked that the control options were standard right out of the box.” The vast lineup of Doosan machine tools that Rick could offer gave PM the confidence to jump brands. Today, PM’s capabilities run deep. Their turning centers have capability up to 8 axes, conventional 3-axis mills as well as 5-axis verticals and also 4-axis horizontal machining centers. With those machines, PM caters to clients such as well-known outdoor power equipment suppliers, manufacturers of material and equipment handling/lifting equipment and some world-famous firearms manufacturers, just to name a few customer types. 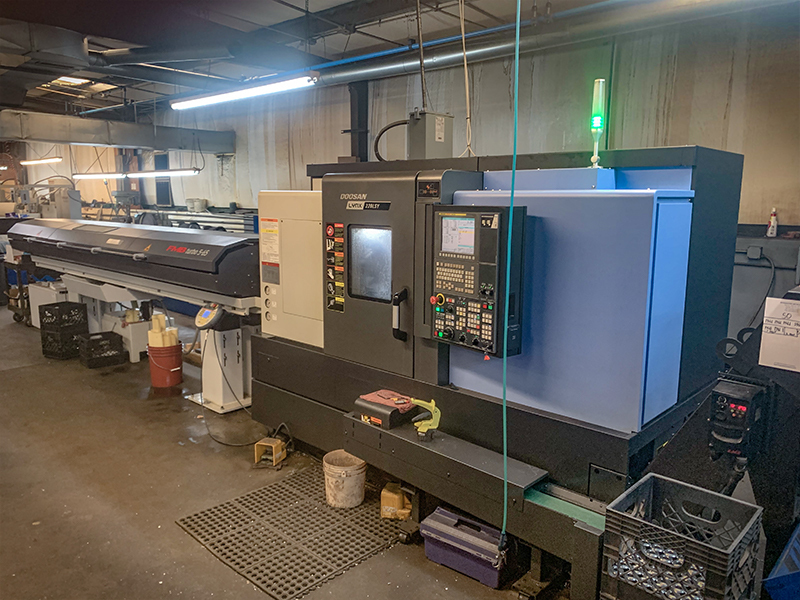 Their latest acquisition from TechMach was an NHP 4000, a 400mm pallet horizontal machining center, sold to them by their current sales representative, Zach Chimarys. Although it's been only running for a short time, PM is already noticing the advantages of the new model by comparing it to the older HP 4000 machine on the floor. New ergonomic features are a perfect example. Updated sheet metal designs make it easier to place parts in the load station, and the side access door is tucked in, making for a better reach to insert tools into the spindle. The machine actually has a smaller footprint than the HP 4000 even though the work envelope is slightly bigger. The CNC control has a larger touch screen, while retaining the same features as the older control, plus some new ones. Ken also likes the faster index times on the new drum type 60 tool magazine, not to mention faster rapids on XYZ axes, all of which translate to faster cycle times. This is vital as the cost of raw materials increase. “The faster we can process the parts, the better,” Ken remarked. Doosan's updates with the release of new models have always made a lot of sense to Ken. “You can tell they are based on customer feedback because they are the kind of things we have asked for,” he said. “But they keep it simple so the learning curve is minimal with each new version.” This keeps interruptions to Ken’s streamlined process to zero when he implements a new machine. With 20-year-old Doosans still running in PM's shop up to 2 shifts a day, Ken appreciates TechMach’s team of dedicated service and application engineers who reduce machine downtime by responding to service calls quickly and effectively. Ken also likes the fact that Doosan machines are made entirely at one location instead of being assembled with components from different points of origin. In the future, Ken feels he has no reason to look elsewhere than Doosan for his machining needs. In fact, he has his eye on automation systems for his shop and the new PUMA V8300 vertical turning center with optional tool changer. With Doosan and TechMach, Ken knows what he's getting and it all has its roots in our Machine Greatness philosophy. To find the nearest Doosan dealer in your area, check out our distributor page.